I was on a train out of Liverpool Street earlier today and was surprised to see the new GE19 bridge had gained an appendage on its west end. 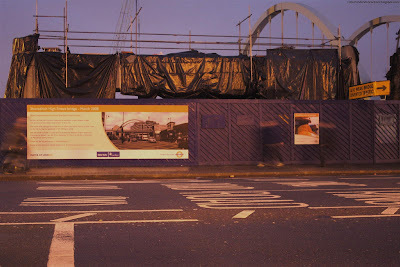 The hoarding advertises the bridge move and road closure in two weeks' time and says the "largest crane in the UK" will be used. Bus users are advised to allow "up to 40 minutes extra" for their journeys. It's a pilot beam used to align the bridge during the push. They are frequently used by the Army Royal Engineers. Roughly the civil engineering equivalent of tying a light thread to an arrow/rocket which is in turn tied to a small diameter rope tied to a hawser etc - used at sea. Its actually called a launch nose. Its purpose is that the bridge beams do not have the capacity in bending beyond a certain point of cantilever. It is very different from army type bridges, typically based on the original Bailey bridge design which are modular in construction, and designed for push launch constructin. 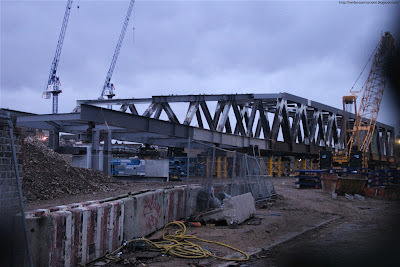 The bridge across bishopsgate is that of a bow string arch, the first time that a bridge of this form with true hangers has been used for rail infrastructure in the UK. hope this is of some interest.